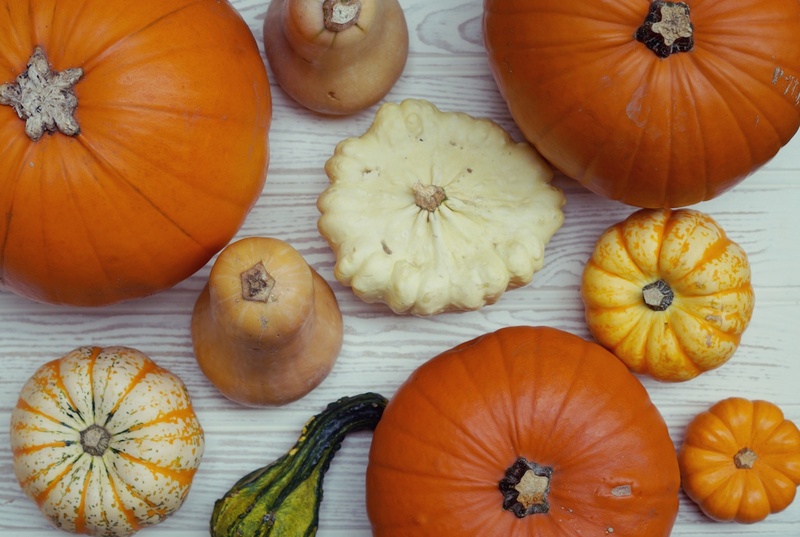 Autumn sees the return of a most versatile root veg, the humble pumpkin/squash/gourd. Each year I have a little word with myself and promise not to get over excited when the gourds finally hit the stores, and yet, every year come October I have a veritable collection. So far this year I have managed to restrain myself to just the above, along with several butternuts that were of course purely for recipe development purposes and not because I need as many pumpkins as I can possibly lay hands on to deck my halls. Yes, we’re big fans of pumpkins here at make, do and spend. 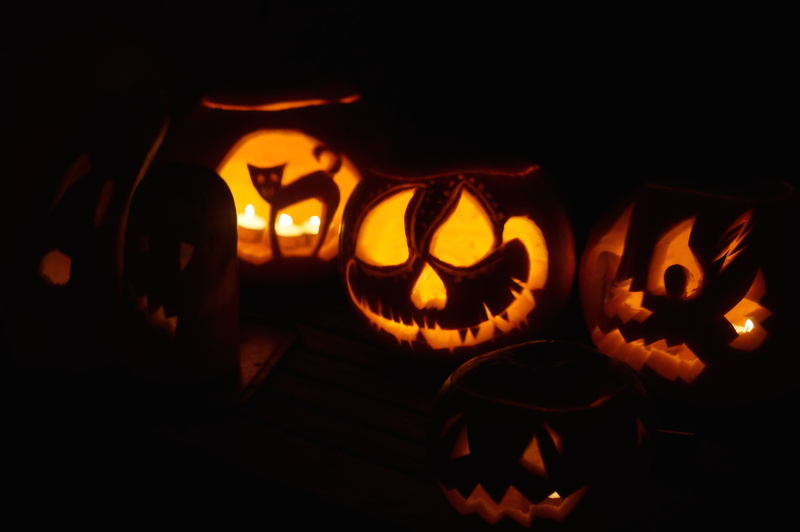 We hold an annual pumpkin carving party which usually involves good food, friends and some outrageous pumpkin creativity. Highlights of which include last years winner Walter White, enchanted forest scenes and my personal favourite, the bread bus which was born out of a Narborough Rd wide pumpkin shortage! So theres always quite a bit of pumpkin to be eaten at this time of year and it lends itself particularly well to sweet treats. 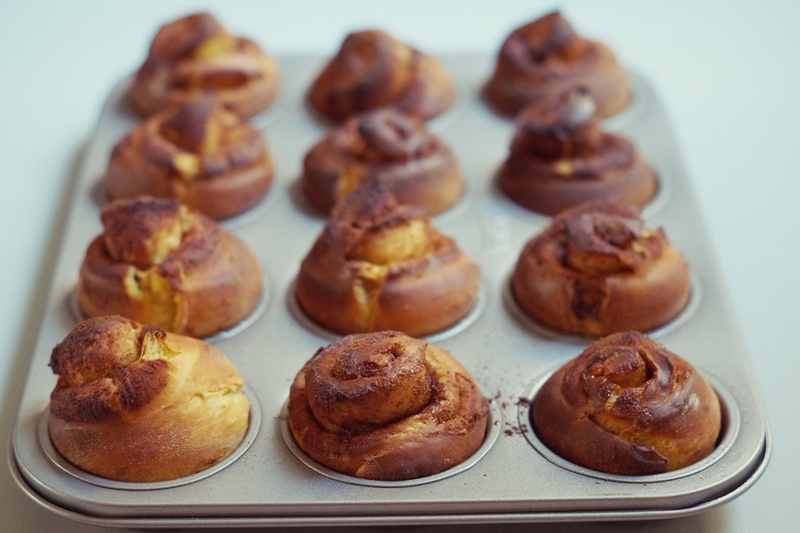 I’ll be eating these little buns for breakfast this week, these are my kind of comfort food. At this time of year enriched buttery doughs are what I crave, particularly when combined with dark sugar and spice! 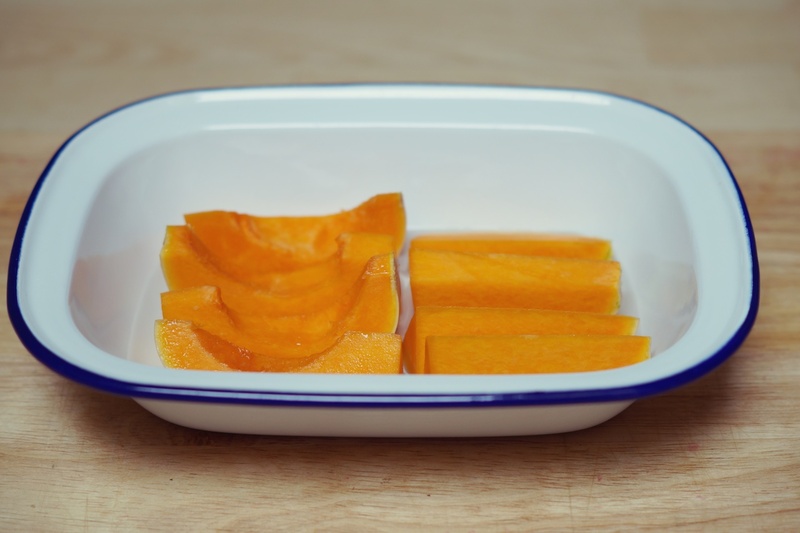 To make the pumpkin puree pre-heat an oven to 180°C and cut the pumpkin into chunks leaving the skin on. place in a roasting tray and pour about 1/2 an inch of water into the base- this will add steam to the roasting process and help break down the fibers of the pumpkin. Roast the pumpkin for around 20-30 minutes until soft. Allow too cool, then peel off the skins and puree using a blender. To make the dough warm the milk to blood temp, so it’s cool enough to comfortably hold your little finger in for a few seconds. Add the yeast, stir until both are well combined and set aside. Place the flour, pumpkin puree, salt, sugar, butter and egg into the bowl of an electric mixer with a dough hook attachment. Start the mixer on a slow speed and stream in the yeast and milk mixture slowly until all the ingredients come together to form a dough, turn the mixer up a little and knead the dough for around 5 minutes so the butter is well incorporated and the dough smooth and shiny. Allow the dough to prove for 1 hr or so until doubled in size. Once proved transfer the dough to a well floured surface and roll the dough into a rectangle measuring around 30cm x 55cm. dot the butter across the surface of the dough then sprinkle over the sugar and spices. Starting with the long edge roll the dough tightly into a long sausage then divide the dough into 12 equal pieces. Allow to cool whilst preparing the cream cheese topping, in a mixing bowl combine both the cream cheese and maple syrup and fold together. 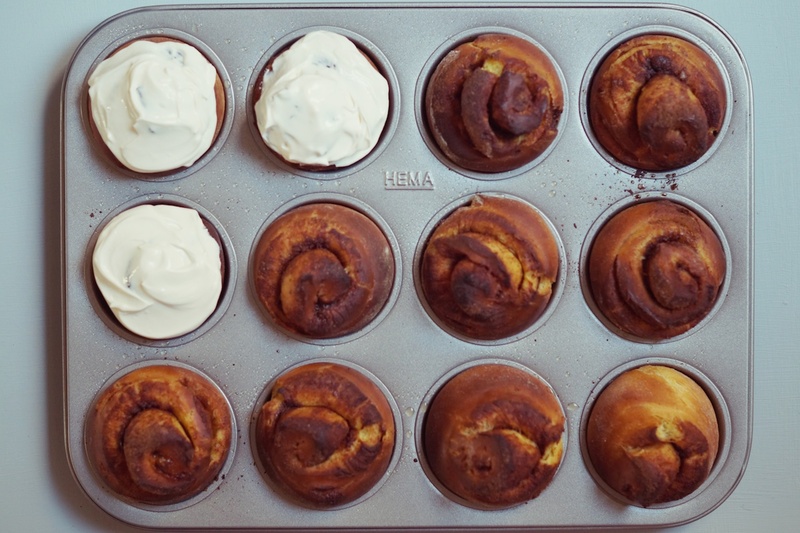 place a spoonfull of the topping over each bun and smooth with the back of a spoon. What are your favourite pumpkin recipes? 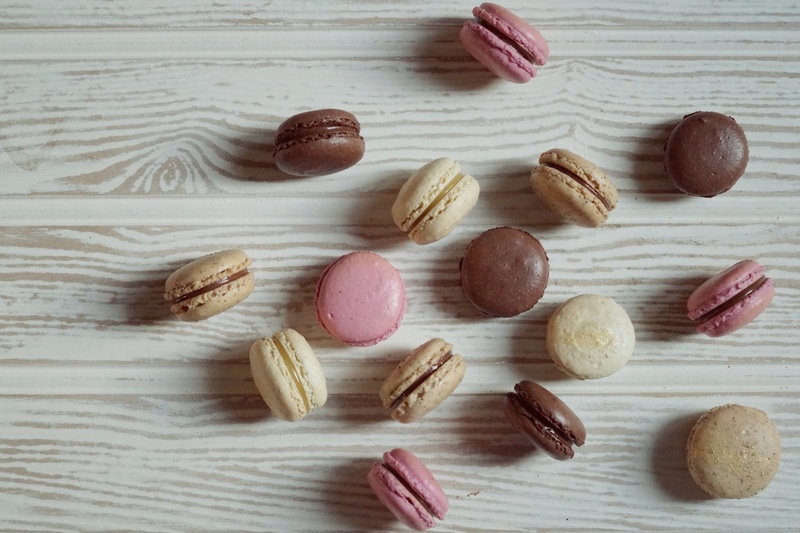 Macarons are quite possibly my favourite sweet treat ever. I can’t think of anything that makes me happier than a display of these brightly coloured almond delights all lined up in an array of exciting flavours. That being said when it comes to making them they have long eluded me. 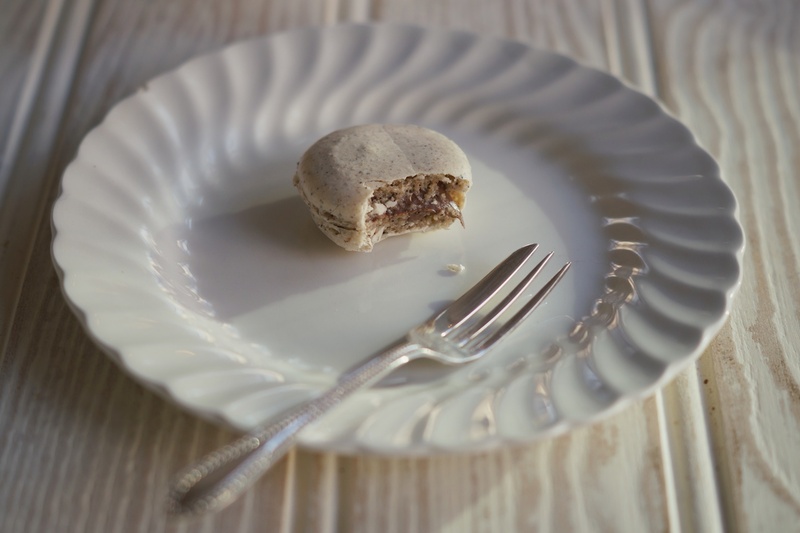 I’ve had so many failed attempts from french to Italian meringue base experiments which have often resulted in some very tasty biscuits and on one occasion, during an experiment with powdered egg white, some very peculiar miniature cakes. Through all the experiments I had never quite managed to achieve that perfect bake profile with a crisp shell and chewy centre, that is until now…..
A few months ago I decided it was time to get serious about this, how can any self respecting baker not be able to master the art of macarons? 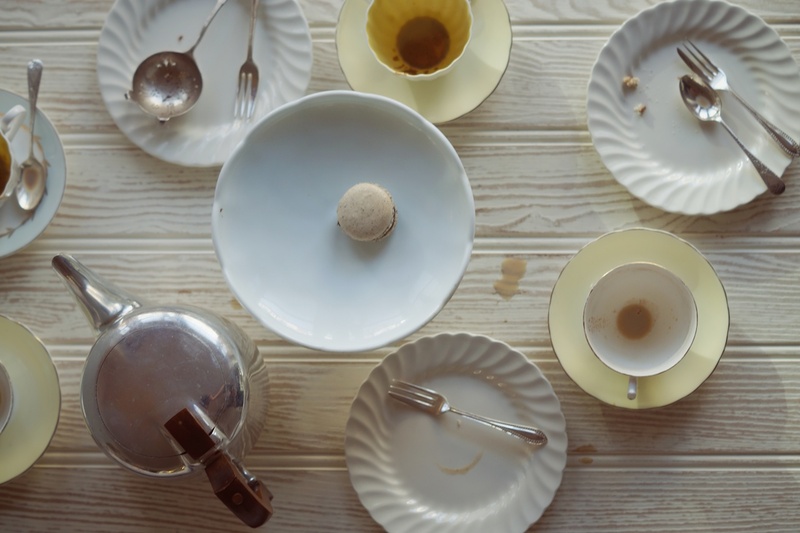 I poured over recipes and researched other peoples success stories, it seems I was not alone in my plight and a suitable method for these little tinkers is often a personal journey of trial and error. It was around this time that I remembered a recipe given to me by my friend Liz. Post a disastrous weekend of baking Liz had offered me the french meringue recipe she used whilst working as a pastry chef in a restaurant run by her family high in the mountains of Morzine. 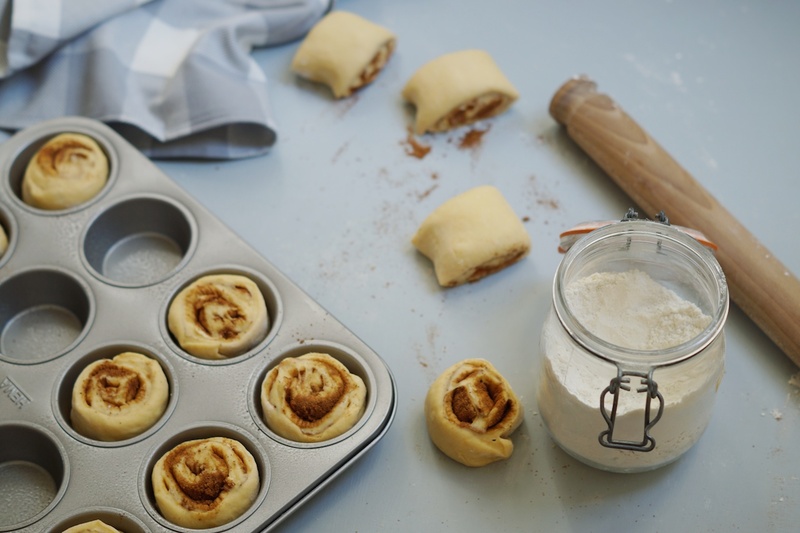 Liz had assured me that this recipe had never let her down, even baking them at a high altitude in the heart of the French Alpes, so this was an encouraging place to start. I followed Liz’s recipe to the T and when the first batch came out reasonably well I had to have another crack, and then another, Raspberry and chocolate then lemon and pistachio followed by chocolate and hazelnut, I was churning them out and by the time I stopped I spent around two days baking nothing but macarons! It had been a long old slog but finally I was making macarons to an acceptable standard. I decided a masala Chai tea party was in order to celebrate my new found skill. Place all ingredients into a spice blender or pestle and mortar and rind to a fine powder. 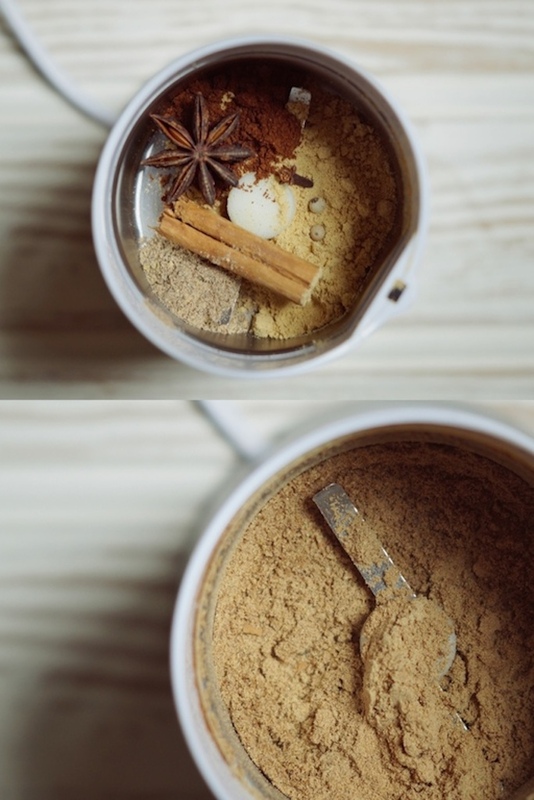 For Masala Chai tea with this spice blend place 1 tablespoon of the mix into a saucepan along with 750ml milk and two black tea bags, bring to a simmer, then transfer to a teapot to infuse. 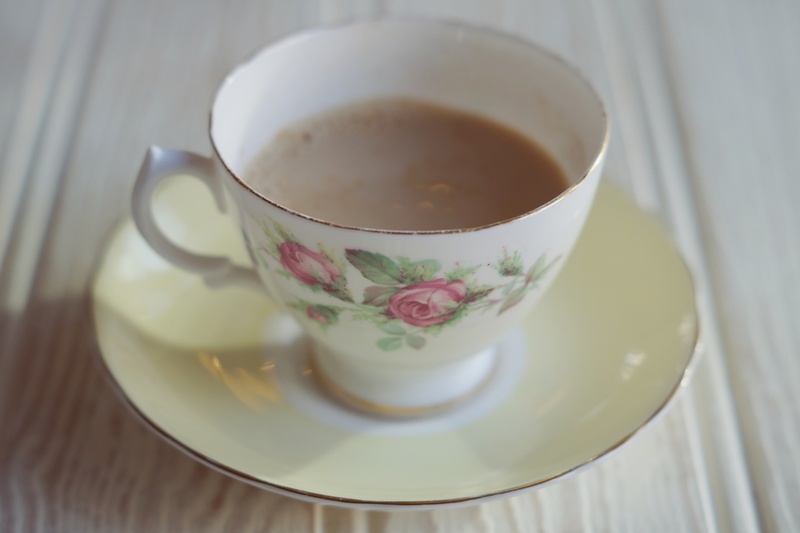 To serve, strain the mix through a fine sieve or tea strainer into tea cups. Pre-heat the oven to 120°C. Sift the icing sugar and ground almonds together with the chai spice and the contents of the tea bag, discard any large lumps of almond that aren’t fine enough to go through the sieve. 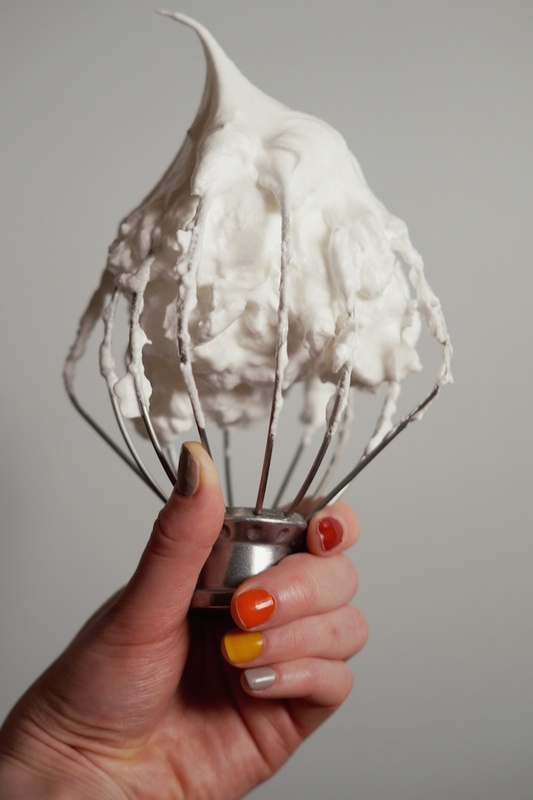 Whisk the egg whites along with a pinch of salt until stiff, then add the caster sugar a spoonful at a time and bring the whites up to stiff peak, and when I say stiff, I’m talking hold the bowl over your head stiff, this is key to getting the crisp shell and lift. This may take around 5 minutes. Fold the almond mix into the whites in two halves, add the first half to lighten the mix, then add the second. Transfer the mix to a piping bag and pipe even circles around an inch in diameter onto a baking tray lined with silicone paper. Once piped lift the tray up and drop it onto the work surface, this will encourage any air bubbles in the mix to rise to the surface, repeat this 5 times. 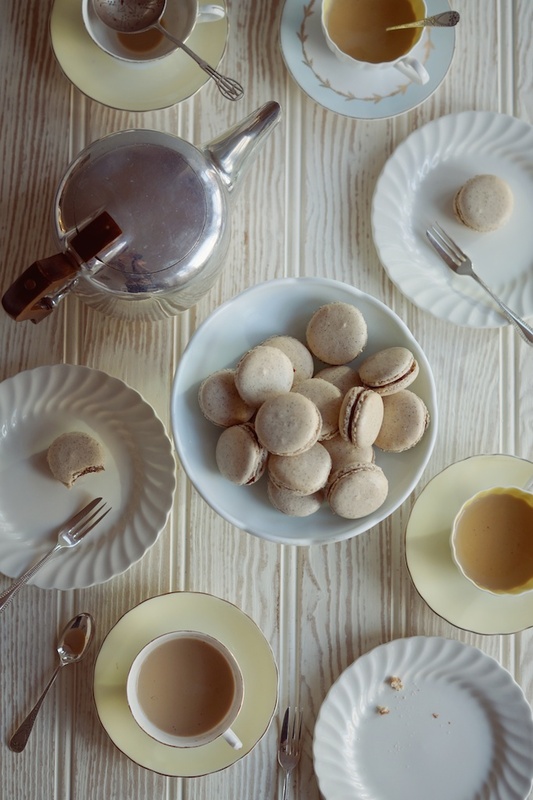 If after slamming the tray there is still a point where the macaron has been piped this can be removed by placing a dampened finger onto the macaron to level it off. Allow the macrons to sit for 15 to 20 minutes to skin over. Place the macarons into the pre-heated oven 1 tray at a time. 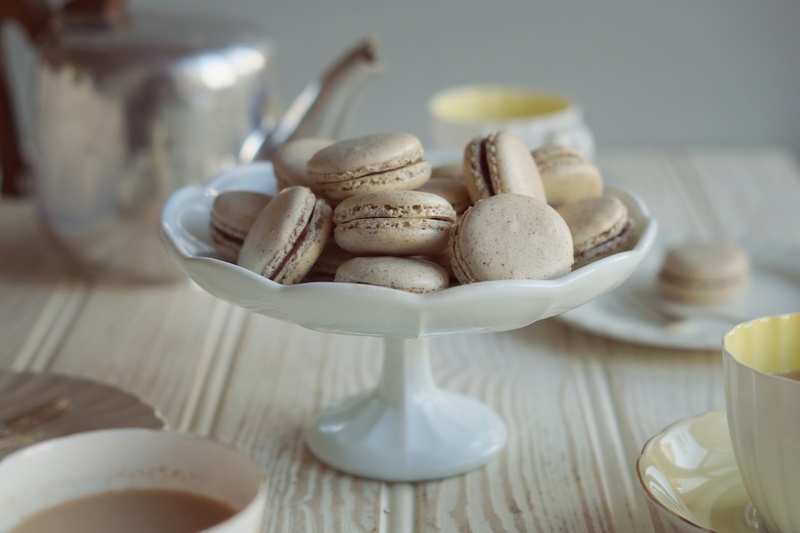 All ovens have hot spots so the positioning of the tray in the oven can also affect the finished result of the macarons. I experimented with different shelves in the oven and for me the second shelf up from the bottom gave the best results. Bake for 10 minutes, turning the tray around after 7 minutes to ensure an even colour all over. Once cool the macarons can be filled with a filling of your choice. I use nutella as a filling for this batch, but chocolate ganache works very well also. 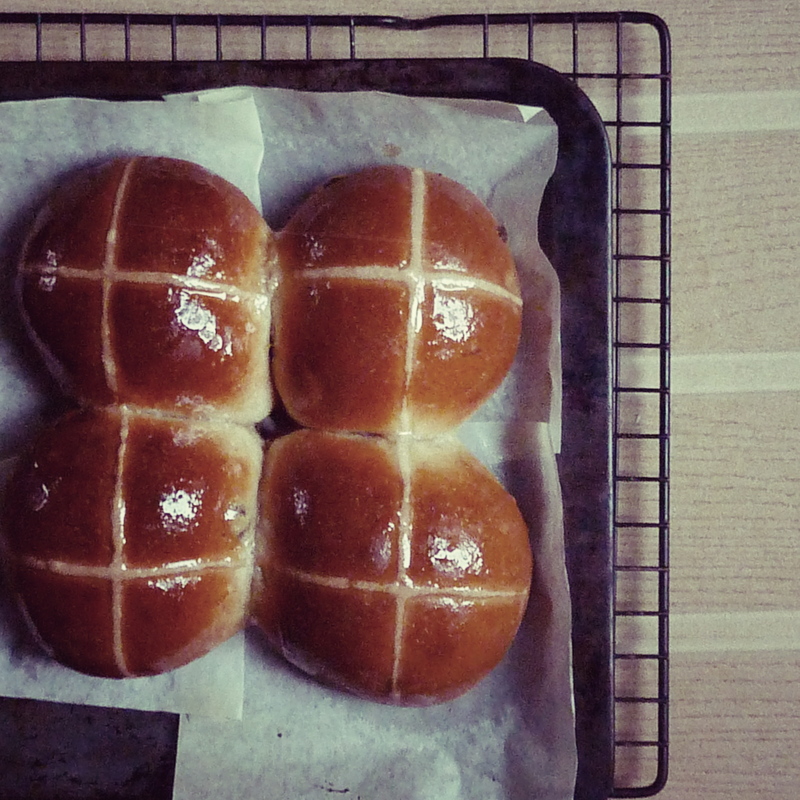 I do love a hot cross bun. 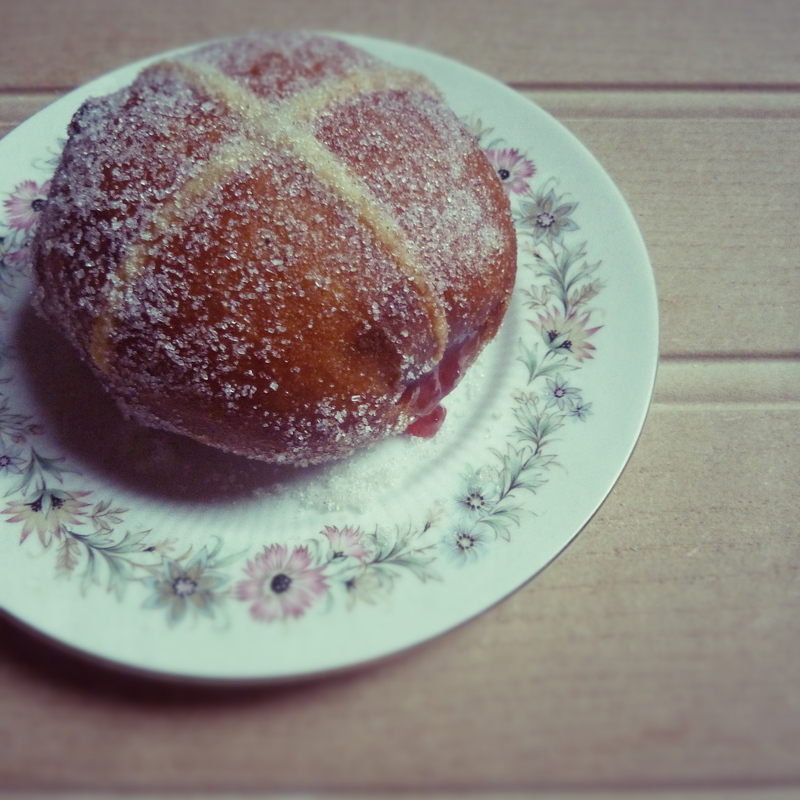 They remind me of my childhood and being late for school on still dark, not quite spring mornings when my mother would prepare breakfast to go- a hot cross bun with a small hole cut into the side with jam squirted inside it, just like a doughnut. Wrapped up in a little kitchen paper parcel these would then be eaten on the journey to school to save time. to make the dough place the flour, mixed spice, salt, sugar, butter, egg yolk and lemon zest into the bowl of an electric mixer with a dough hook attachment. Place the warm water in a measuring jug and add the yeast, stir until both are well combined and milk like in consistency. Start the mixer on a slow speed and stream in the yeast and water mixture slowly until all the ingredients come together to form a dough, turn the mixer up a little and knead the dough for around 5 minutes so the butter is well incorporated and the dough smooth and shiny. 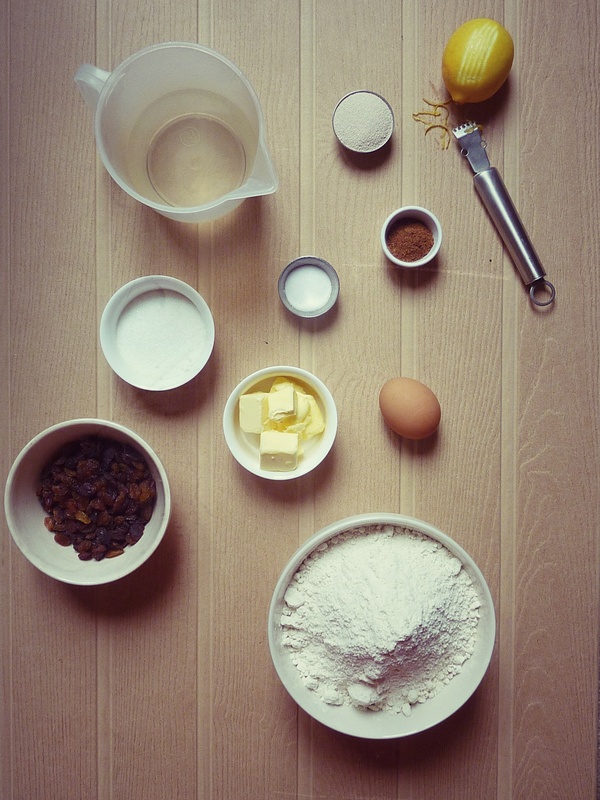 Add the fruit and mix for a minute to incorporate then turn the dough out onto a well floured work surface. 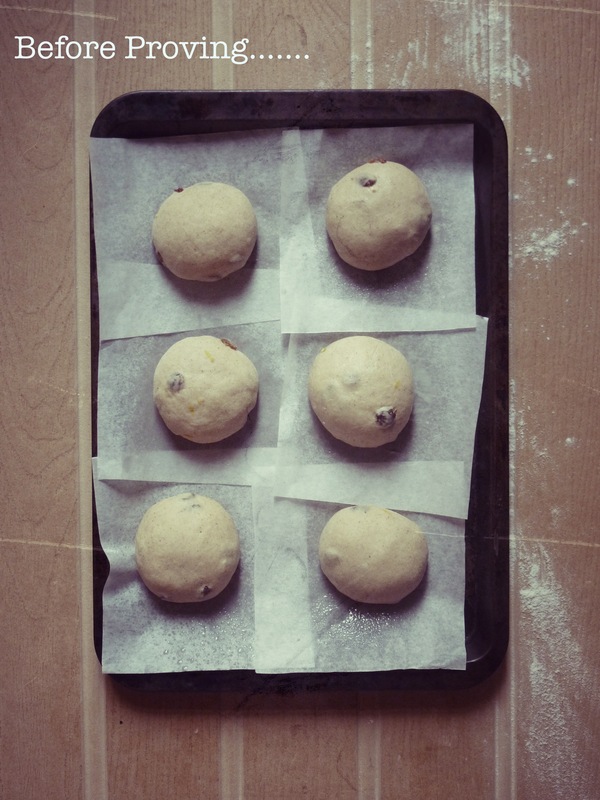 Divide the dough into 8 equal pieces and roll into balls. 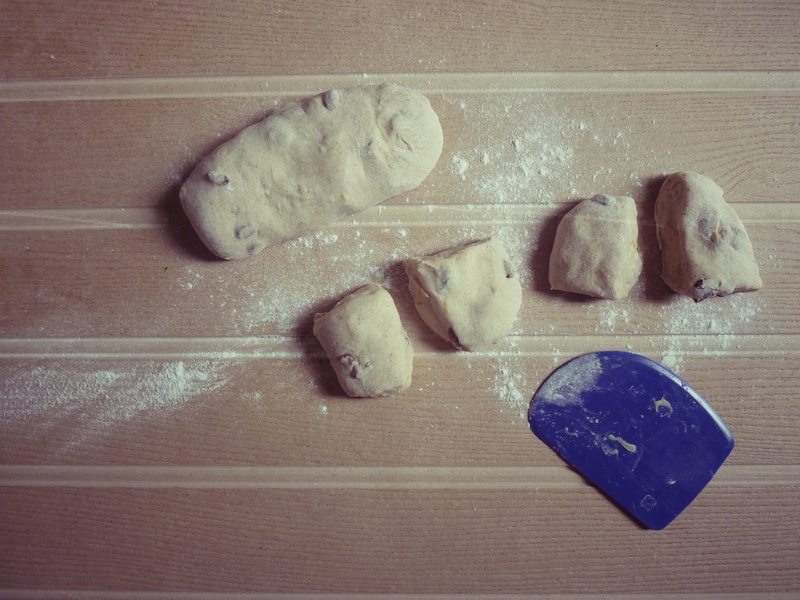 Place each ball onto it’s own individual square of silicone paper sprayed with a little non stick baking spray to prevent the dough sticking to the paper during proving – this will help later when frying. 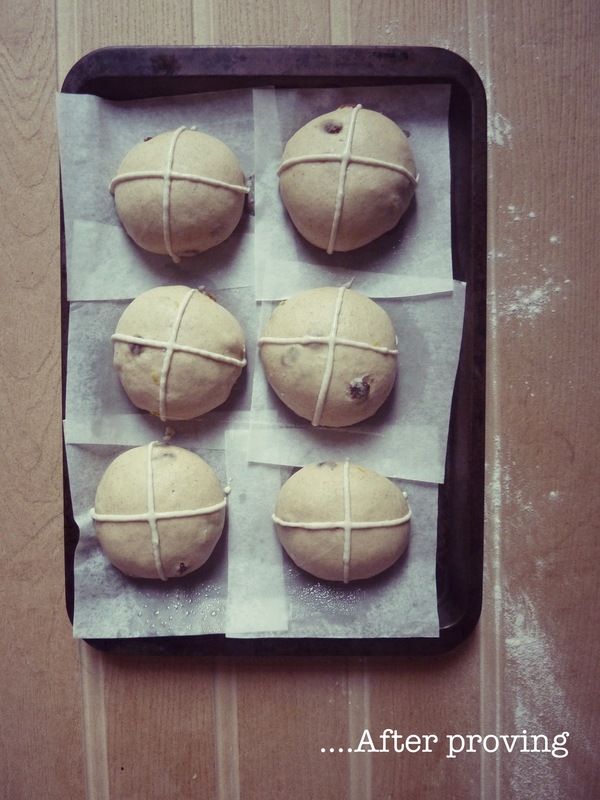 Once the buns are proved make the hot cross top by mixing the flour and water together in a bowl. Add the water very slowly until it forms a paste that is thick enough to still hold it’s shape when piped. Transfer the mix to a piping bag, snip a small hole in the end and pipe the mixture in a cross shape on top of each bun. Now the buns are ready to be cooked. 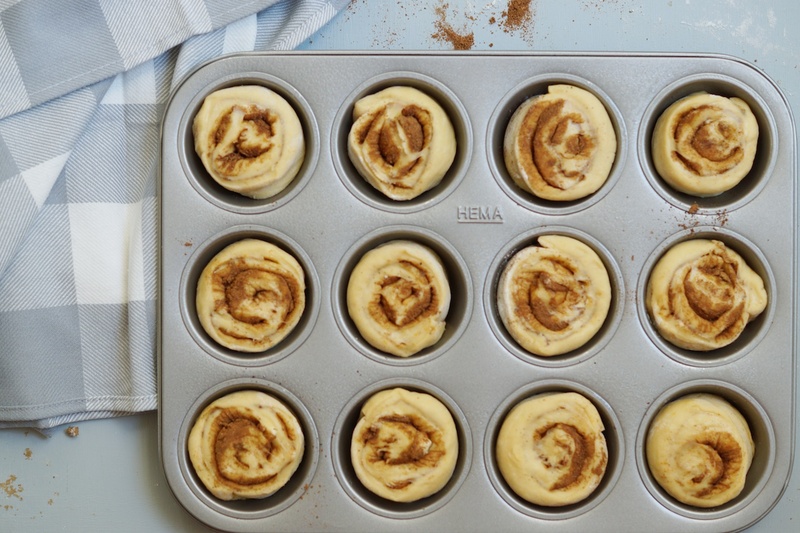 Mix together the sugar and cinnamon in a shallow bowl and set aside. Carefully Heat the oil in a saucepan to a temperature of 160 °C, if you have a deep fat fryer for this all the better, if not take great care when heating oil, it gets HOT! Have some kitchen roll ready to catch any drips and use a heatproof slotted spoon to turn the doughnut and to take it out of the oil safely without burning any fingers! I don’t have a deep fat fryer so heat my oil on the hob using my jam thermometer to measure the temperature. This does fluctuate and for my first batch of doughnuts I cooked them at too high a temperature so they were beautifully golden on the outside but still raw on the inside! As long as the temperature keeps between 160 to 170°C the doughnuts should cook through and be light and fluffy on the inside whilst not colouring too much on the outside. I cooked mine one at a time for 3 to 4 minutes each side, until they were golden and made a hollow sound when tapped, much like how you would test if a loaf of bread is cooked. Once ready transfer the doughnut to the bowl full of sugar and cinnamon and roll the hot cross doughnut so it is completely covered in sugar. Once the doughnuts are cool it’s time to jam up. 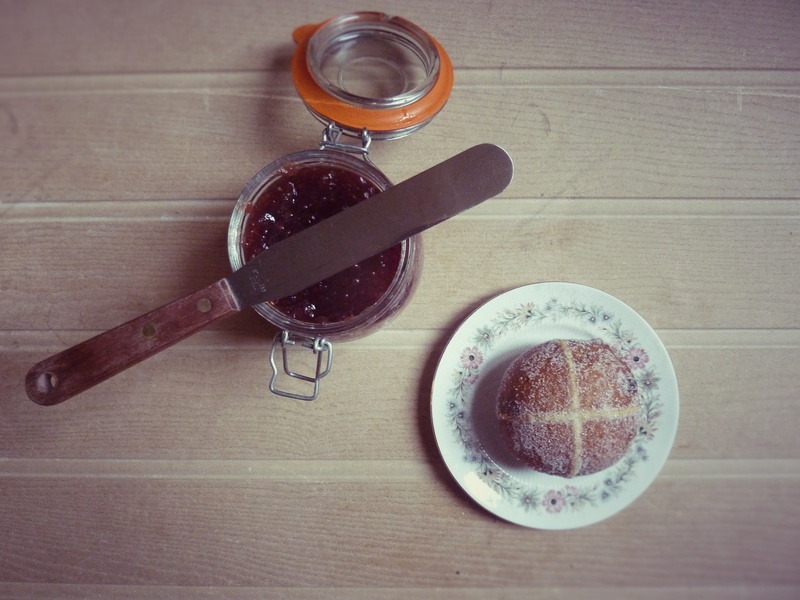 I used the last of our rhubarb, raspberry and ginger jam to fill mine, any good raspberry jam should do the trick, and apricot jam would make a rather tasty alternative. Cut a small hole in the side of each doughnut and using a piping bag or spoon fill the doughnut with jam until it bulges and just a little jam seeps out of the hole. Doughnuts really are best eaten warm and fresh and honestly, the smell is quite irresistible it would be rude not to dive straight in! 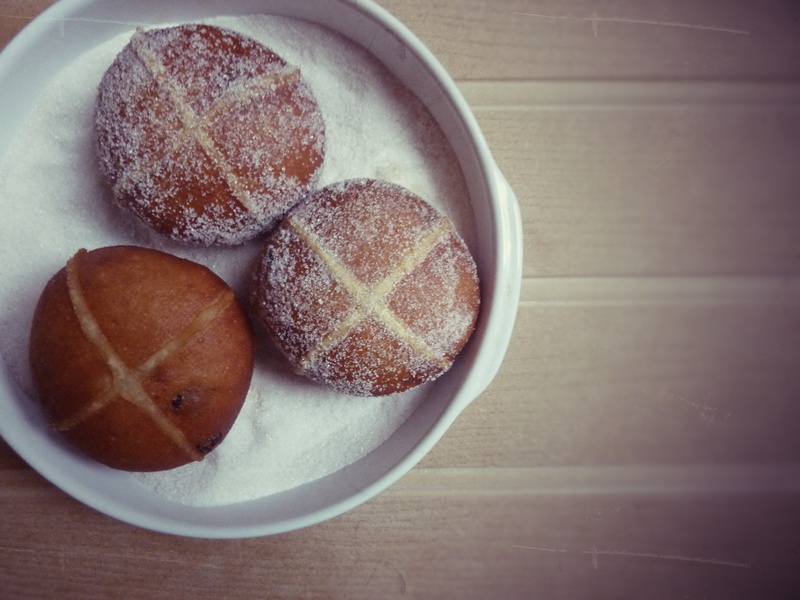 When developing this recipe I looked at both a doughnut and a hot cross bun recipe and merged the two, it’s essentially a hybrid of both and as deep frying is indulgent I decided to bake a few off to see what would happen. Results were good and I can confirm that if you wanted a lighter option, the above recipe can be baked in the oven at 200°C for 15 to 20 minutes until golden brown. Once cooked remove from the oven and glaze with some stem ginger syrup. 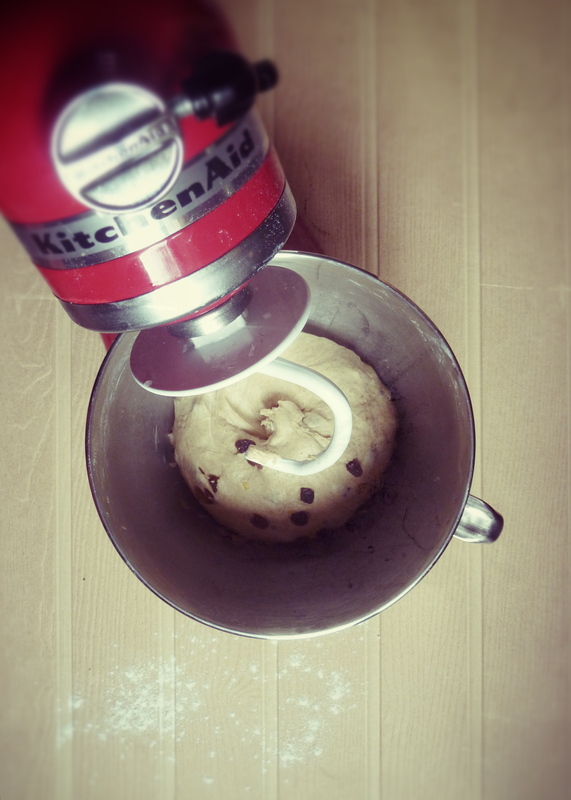 For baking I would also recommend swapping the water in the dough for warm milk to give a richer, fluffier finish.